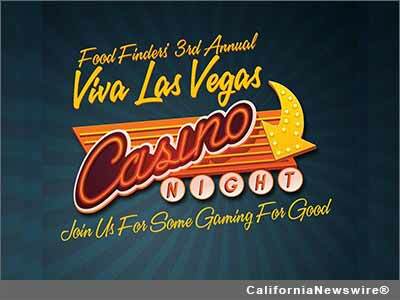 SIGNAL HILL, Calif. /California Newswire/ — For the third year in a row, Food Finders is betting that its Viva Las Vegas Casino Night will be another fundraising success, sure to offer something for everyone. On September 21, 2013, the 24-year young non-profit will celebrate its 100 millionth pound of food rescued by hosting the event at the Alpert Jewish Community Center in Long Beach. "We've invited all the Long Beach mayoral candidates to come play, and so far the majority have confirmed they'll join us that evening-who will fold and who'll go all in? You'll have to show up to find out!" shared Patti Larson, Executive Director. Proceeds will support its Food Rescue Program, which has been on a steady track all year in providing enough food for 40,000 meals a day. Featured at the event will be Blackjack, Roulette, Craps and a Poker Tournament, which this year might prove a little more competitive than usual. When not gaming for good, guests can enjoy delicious food by Ehrhart Catering and desserts by local favorites Sweet and Saucy and Rossmoor Pastries. A silent auction will feature specialty jewelry, spa visits, travel opportunities, amusement park passes, Hearst Castle tickets, S.C.U.B.A. Dive classes and culinary and floral design experiences along with some irresistible gift baskets. All guests will be encouraged to enter the opportunity drawing at the end of the gaming period for a chance to win casino prizes. The evening will kick off at 6 p.m. with lively music from DJ Mark Samson, cocktails and silent auction, followed by gaming and gourmet food at 7 p.m. Tickets to the event are currently on sale online at www.foodfinders.org with prices set at $45 per person, $80 per couple and $20 for a seat in the Poker Tournament. Each ticket purchase includes casino cash to spend. Sponsorships are available for any businesses that wish to support hunger relief. Contact Lisa Hoffmaster at 562-598-3003, x103 or lisah@foodfinders.org for more info. Food Finders, Inc., a 501(c)3 nonprofit, provides food to feed needy families, children and seniors in Los Angeles and Orange Counties via a network of food donors and recipient agencies. For more information on how you can help, visit http://www.foodfinders.org/ or call 562-598-3003.